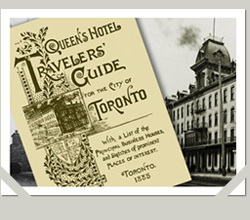 While it’s unclear how many dentists were operating in Canada West on January 3, 1867, when Day arrived in Toronto, but just eight dentists were waiting for him at the Queen’s Hotel. Much to Day’s dismay, M. Edward Snider was the only dentist from Toronto, Canada West’s hub of dentistry. The seven other men present were all from eastern Ontario: Franklin G. Callender, J. Stuart Scott, MD, Henry Tunstall Wood, Antoine Lalonde, Curtis Strong Chittenden and D.A. Bogart. Despite this small turnout, Day’s pluck and initiative had caught the profession’s attention, and other dentists unable to attend this first meeting sent letters of support for the formation of the organization. Among the dentists who could not attend the meeting was George Van Nest Relyea, whose membership was so desirable that the nine attendees elected him to membership in his absence. Small turnout or not, it was at this January meeting that these men, led by Barnabas Day, decided to build an association that would formulate a law requiring dentists to pass an examination. From humble beginnings, these men built the first official organization of dentists in Canada, the Dental Association of Canada West, today known as the Ontario Dental Association. Day was elected president of this new association, and selected to chair a committee to draft a dental act that the association would present at the next session of Parliament. Learn more about the John O'Donnell, Henry Tunstall Wood, Curtis Strong Chittenden and George Van Nest Relyea in the pages of Ontario Dentist: The Journal of the Ontario Dental Association.